This month, Ben McConnell and Jackie Huba join Anil Dash, Six Apart VP and resident evangelist, to talk about their new book, Citizen Marketers, and how the Internet is changing the way people interact with companies and organizations. They classify common profiles of online influencers -- fanatics, filters, facilitators, and firecrackers -- and talk about how businesses can begin to understand that the people who care about their products are, ultimately, the message that companies send. You can listen to the podcast (27:42) by clicking on the icon below, or right-click to download the entire MP3 to your local computer or music player. 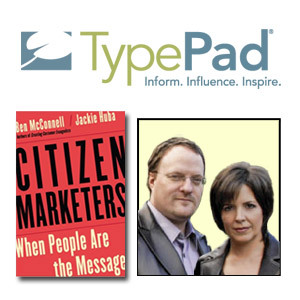 Sign up for TypePad Pro, annual subscription, with the promo code PEOPLE and get a free copy of Citizen Marketers.